Businesses have countless reasons for setting up a Facebook page these days. Building brand loyalty, generating website traffic, improving customer service, driving offline sales and product research are all examples of outcomes brands value and are looking to achieve when setting up shop on the world’s largest social network. Generally speaking, all of the desired Facebook marketing outcomes listed above are predicated on building a solid community of individuals who are inclined to enjoy your product or service and then engaging with this community every day on a somewhat personal level. So how do you do that? It’s actually easier than you think, providing you are willing to invest a bit of time and money in your Facebook efforts. Creating images that will engage fans. I have also included a couple of case studies from recent client Facebook campaigns that illustrate many of the suggested tactics in action and the success we reached by implementing them. 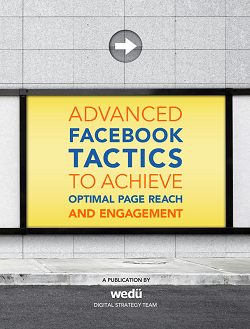 I hope you find this Facebook eBook helpful. Please leave a comment below or send me a Facebook message and let me know what you think. I love feedback!